One year on from the Grenfell tragedy, emergency lighting remains a key priority for building and facilities managers. The official Grenfell Tower Inquiry hearings, 21st May 2018, post-date the actual, awful event by some 11 months; however, media reports in the immediate aftermath of the tragedy indicate that aspects of the building’s design, including the single staircase and its safety features, were inadequate. In light of this, key building and facilities decision makers need to understand how to ensure they diminish the possibilities of lighting failure. They must ensure that the highest standards of safety are met, to protect themselves and their business from liability and potential prison sentences. The importance of emergency lighting cannot be overstated, and it is crucial that fittings are fit for purpose, deliver the appropriate output, and are regularly tested. By choosing an emergency solution that fulfils these requirements, those responsible can be confident that they will not be found liable and potential danger to life is avoided. When it comes to emergency lighting, quality assurance rather than price is key. Cheaply-made fittings using low-quality materials may provide sufficient illumination initially, but may not provide the required lux levels over time. The objective is that ‘3 hours Emergency lighting’ must last for a minimum of three hours at the end of year 4, not just at point of installation. Tamlite Lighting provides a wide range of high-quality emergency lighting solutions, with fixtures that can be applied to an array of environments. These have been designed to provide essential emergency lighting, compliant with all UK building regulations, and can give lasting assurance to building managers. Being able to see during an emergency situation enables occupants to find their way out of the building safely and reduces panic. Emergency lighting solutions illuminate an area or highlight the quickest path of escape if the regular mains-run lighting fails. The cause of failure could be a simple power cut, or could be the result of something more severe. Emergency lighting is crucial, regardless of the severity of the situation. In the event of a power cut, the situation is not necessarily life threatening, but may occur for a long period of time, and a lack of adequate illumination could result in an accident. However, in the event of a fire or any other situation that may cause harm, occupants will need to vacate the building quickly and safely. In both situations, emergency lighting needs to be high output, and run for at least three hours. Building and Facilities managers must be familiar with the regulations in place covering all aspects of a building, its services and safety and their legal responsibilities to ensure compliance. For example, there are a number of key regulations pertaining to emergency lighting. Managers need to ensure that the safety lighting installations in buildings they manage are fully compliant. All Tamlite Lighting emergency products are compliant with BS EN 60598-2-22, a legal requirement under the Regulatory Reform Order (fire safety) 2005. The ensures manufacturers produce fully fit for purpose emergency lighting products. Tamlite Lighting manufactures a wide range of emergency lighting solutions, as a well as a number of general lighting solutions which have integral emergency options. These integral emergency options in new fittings mean that when Tamlite products are installed at a site in a large-scale project, the whole building can be supplied with high-quality integrated emergency lighting solutions, without the need for separate emergency lighting products. Maintained emergency fittings can be used in ‘always on’ configuration, for use in for corridors. Non-maintained fittings illuminate only if the power supply fails. Both types of solution have emergency modes, which will suitably illuminate the space or exit route if the power supply fails. Installing emergency lighting in a facility does not necessarily require a wholescale refit of the current lighting. 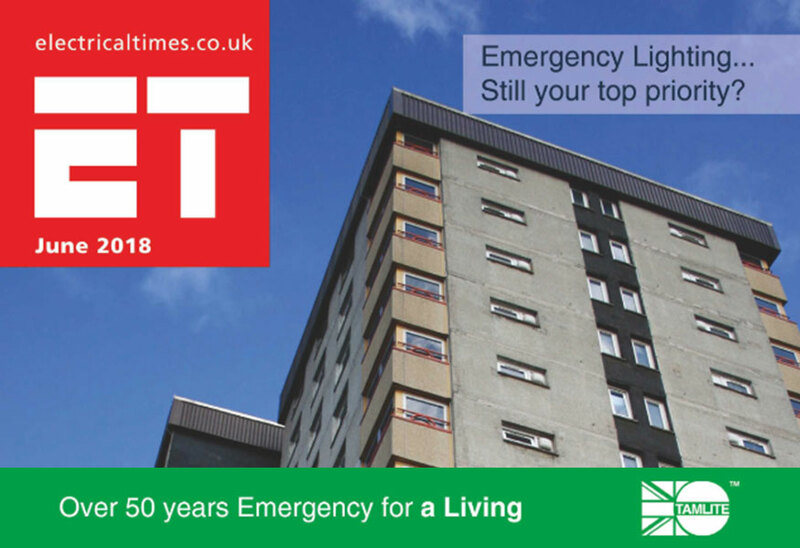 Tamlite manufactures a range of retro-fit emergency lighting solutions, which can work in conjunction with existing fittings. Tamlite also manufactures a range of signage products, which highlight escape routes from buildings. These have been designed to function in a range of environments. Tamlite supplies weatherproof fixtures to work outdoors to signify assembly areas, and aesthetically pleasing exit signs that are discreet when not in use. Utilising LED emergency lighting means that Tamlite luminaires can provide sufficient illumination while maintain energy efficiency. Maintained emergency fittings are often on at all times, so it is crucial that they have high efficacy and reduced energy consumption. It is also important that the parasitic load is reduced, to minimise energy consumption even when not in emergency mode. Tamlite provides a comprehensive emergency testing system, e-Connect. This automatic self-testing system allows scheduled maintenance programmes to be carried out, without the need for walking around the site and testing each fixture individually. The e-Connect system provides an easy-to-use system for engineers and site managers to schedule testing, monitor status and report testing schedules and results to a central network point. Regular testing of emergency lighting is crucial, because any failures must be detected and rectified as soon as possible. This could be the difference between a safe exit and life-changing injuries, or even fatalities. Emergency lighting is one of the most important aspects of any facility or building. It is important that the emergency light fittings installed at a site are fully compliant, reliable, and regularly tested and maintained.